J. Evans Dairy a Grade II listed building on the corner of Warren Street and Conway Street. Built 1793 and tiles circ. 1916 a rare surviving example of a Welsh dairy. It is a cut through we cabbies use when wishing to turn into Euston Road from Tottenham Court Road, by turning down Warren Street we miss the traffic and join the bus lane at Great Portland Street which also has the added advantage if you time it correctly of enabling you to collect your evening newspaper without the inconvenience of having to stop as the friendly vendor standing on the corner presses the paper into your hand. I have used this cut through numerous times and have always admired this little corner shop with its blue tiles hardly realising how important the shop was. Before we had supermarkets which now supply all our provisions, we were served quite adequately by door deliveries and one of the last to survive is the milkman. From about 1860 onward, as a result of hard times in Wales, many Welshmen, especially from Cardiganshire set up dairy businesses in London. Keeping cows on the premises in the middle of London, many if these dairies were set up in close proximity to the Marylebone/Euston Road which leads directly from Paddington Station, the mainline terminus of the Great Western which serves South Wales (in fact until very recently all early morning trains were still called ‘milk trains’). In King’s Cross Road there is a faded sign of a company that supplied all the paraphernalia needed to produce milk products. London is home to the oldest and largest Welsh community outside Wales. The middle of the 19th century saw an exodus of Welsh dairymen to London with many setting themselves up as dairies. By 1900 it is estimated half of all dairies in the capital were Welsh. Even by 1950 there were still over 700 Welsh dairies in the City. The last survivor in Clerkenwell is believed to have closed as recently as 2001. It’s remarkable how many replies I’ve had about my post on Welsh dairies. Thanks for taking the time to read my small contribution. Try this link, I know the family business is Jones, but they were Welsh and the dairy was situated very close to Cleveland Street, Bethnal Green. The Gentle Author the writer of the post is a well respected journalist and authority of this area of London. Are you aware of Megan Hayes’ book on the Welsh dairy trade in London in the mid-19th century.its in welsh, but here’s a book review in the London Welsh Society’s newsletter. The book is in welsh. The English version i called The London Milk Trail, (by Megan Hayes), ISBN 978-1-84527-551-8. Your contribution is on pg.93 -thank you so much for bothering to send it. Thanks for taking an interest in CabbieBlog, unfortunately my Welsh is a bit rusty these days. When you look at the old shop fronts it’s incredible just how many Welsh dairies there were in London. Now unfortunately there are hardly any independent dairies – anywhere. I seems now in London every commercial building is now being turned into ‘executive’ flats. Searching Wales census and finding there were several refs to dairymen (and women) named Evans in London,and wondering why so many from Wales. Your comments have been gratefully acknowledged. Jenkin Evans may be the J.Evans in photo. If you can get access (Ancestry, Find My Past) it’s worth looking in the old trade directories of an area. They might have details of any Welsh dairies and the owners. I take it that is Clifden Road E5 because I’ve found two others. Good luck with finding more about them. I found this old egg box in the Provence (Bédoin, to be precise). Couldn’t resist it and bought it. Dairy Outfit Co~, King’s Cross, London. Interesting to find the lettering of the old company, still visible on the facade. My great grandmother Mary Elizabeth Rowlands was born in Tre Taliesyn in Cardiganshire, and according to family legend was sent to work in a Welsh dairy in Little Britain sometime between 1871 and her marriage to a Londoner, Joshua Sparks, in 1881, her age then was 21. It was rumoured that she may have been sent because she got pregnant outside marriage, but I also think it may have been due to poverty, as her father had disappeared by 1871 at home in Wales. Thank you for this information on Welsh dairies. It helps reinforce family oral history! If by any chance anyone stumbles across information on this dairy in Little Britain, please let me know. Hitler of course put pay to that part of London during the blitz. Amwell Street is literally just around the corner from us and I know Lloyds Dairy well. These days it is run by Unpackaged, an eco-friendly shop that sells from bulk and invites you to bring your own bottles, bags and boxes. Before that, it did briefly become a Welsh grocery store again, selling all sorts of wonderful products from Wales. We bought a few things there to try and would have bought more but the business mysteriously closed for reasons that never became clear (though, bizarrely, “staff holidays” were blamed at one point). 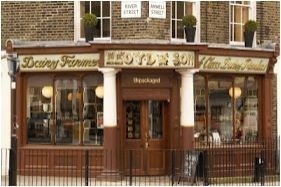 There are many old specialist food shops (diaries, grocery stores, butchers’ shops, bakeries, etc) still visible in London, though not all are as well preserved as Lloyds and your other example, French’s. They can often be recognized by such features as the aeration grill running across the top of the shop window, hooks above this for hanging out goods on display and the tiling on the walls. In cases where English Heritage has listed the building, it is often recorded in the listing text what the business was but in other cases it is harder to discover its history which might, after all, be quite mixed. When you look at older buildings in London you don’t always immediately know what you are looking at. It sometimes takes a sharp eye and a certain intuition to recognize something a little out of the ordinary. But what a feeling of satisfaction when that intuition turns out to be right! 1895 The trial of Oscar Wilde began at the Old Bailey accused of gross indecency. An inspector from Scotland Yard had previously appeared before magistrate John Bridge to request a warrant for Wilde’s arrest. Bridge adjourned the hearing for an hour-and-a-half, apparently to give Wilde time to make his escape from England on the last train to the Continent, as the playwright’s friends had urged. But Wilde could not make up his mind and finally left it too late. It is astonishing how little we know about the five victims of Jack the Ripper, apart from their names and the bungled investigation into their deaths. The Five is not simply about the women who were murdered in Whitechapel in the autumn of 1888: it is for them. This is a powerful and a shaming book, but most shameful of all is that it took 130 years to write. "In 1952 a Nigerian visitor was fined £50 for committing an indecent act with a pigeon in Trafalgar Square and £10 for having it for his tea"
"In 1938 a pedestrian was killed by a stone phallus falling from a statue on Zimbabwe House in the Strand other appendages removed for health & safety"
© 2009-2019 Licensed under a Creative Commons Attribution License (CC BY-NC-SA 3.0).